The match lived up to its excitement and thrills right from the start until the final whistle. Nikao had the wind behind their backs edged out Tupapa in terms of ball possession however early in the game Tupapa was the team with two goal scoring opportunities but the final touch was not effective to convert this into goals. In the 26th minute tricky Teariki Mateariki was given the ball by his opposition defence and went past another Tupapa defender and placed this ball past the goal keeper for the first goal of the match. Nikao Sokattak left winger Kunda Tom had a great game and went past the Tupapa right defence on several occasions and created problems for his team’s opponents. The score remained at 1-0 at half time. In the second half Nikao Sokattak started where they left off in the first half and created another goal scoring opportunity but the finishing touch was poor. With 25 minutes remaining in the match and with the strong wind in their backs Tupapa Maraerenga took control of the game and dominated ball possession and created three goal scoring opportunities of their own. In the 77th minute Nikao’s goal keeper tried to clear a corner kick only to find the boot of Rhys Ruka who curled the ball with the outside of his boot straight back into the goal. Tupapa tried to score the winner but could not find the back of the net with the full time score locked at one all. The penalty shootout was used to decide the winner with Nikao Sokattak scoring three of their five attempts with Tupapa scoring only two of their attempts. 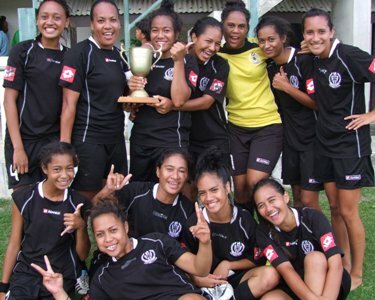 In the senior women’s division it was the same score-line as the premier men’s at one all at full time between Titikaveka and Tupapap Maraerenga. Penalty shoot out was also used to decide the winner with Tupapa scoring four of their five attempts and Titikaveka managing three of their five attempts. The Under 17 Men’s knock-out finals between Nikao Sokattak and Tupapa Maraerennga was an exciting one with the score at one nil throughout most of the match Nikao hammered the final nail in Tupapa’s coffin one minute before full time to bring the full time score to two goals to nil in favour of Nikao Sokattak. In the Under 14 Girl’s division round cup champions Tupapa Maraerenga easily defeated Arorangi by three goals to nil. The Under 14 Boys team from Nikao showed why they are also the round cup champions by beating Arorangi by three goals to nil. The Cook Islands Football Association would like to congratulate all the teams in this year’s round cup and knock-out competition and would like to wish everyone a Happy Christmas and a Merry New Year.